Baskets Unlimited, established in 1987, has been owned and operated by Jan & Lorren Weber since 1995. 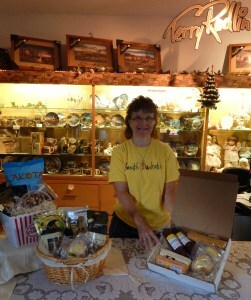 We have since changed the name of the business to South Dakota Baskets Unlimited. South Dakota Baskets Unlimited is located at Mina Lake, Mina, SD, where products can be purchased individually or baskets can be custom designed while you wait. Jan & Lorren are especially proud of their gift baskets and gift boxes filled with some of our state's finest products and novelties. Our custom-made baskets and boxes are created with the unique tastes of Smoked Pheasant, Smoked turkey, Buffalo, Elk and Beef Salami combined with Cheese, sweets and snacks like candy, jams, fruit syrups, flax pancake mix, kuchens and many other products. Other gift ideas are jewelry made from South Dakota tree leaves, playing cards, cups, plates, South Dakota souvenirs, plus more. We carry a wide selection of Terry Redlin Collectables (framed linen prints, mugs, coasters, ornaments, clocks, signs, plates & plate holders) along with a great line of Casual Tables. They also have a variety of collectible items such as plates, mugs, signs, also casual tables and etc. by South Dakota Artist Rosemary Millette.